A power tool is a tool that is actuated by an additional power source and mechanism other than the solely manual labor used with hand tools. The most common types of power tools use electric motors, pneumatics, or hydraulics. Never carry a power tool by the cord. 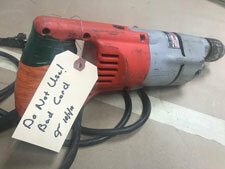 Never disconnect a power tool by yanking the cord to remove the plug from the receptacle. Keep tool cords away from sources of excessive heat and sharp edges. Disconnect tools when not using them, prior to servicing and cleaning, and when changing accessories such as blades and bits. Keep people not involved in the work at a safe distance. Secure work with clamps or a vise. This allows you to operate the tool with two hands. Do not hold fingers on the power button while carrying a tool that is plugged in. Follow the instructions provided in the user manual. Keep good footing, and maintain good balance. Wear proper apparel for the required task. Avoid wearing loose clothing or jewelry that can become caught in moving parts. Wear proper personal protective equipment such as gloves, face, and eye protection. Always inspect power tools prior to use. If a tool is not in safe operating condition, remove the tool from service, and affix a "Do Not Use" tag. Source: OSHA Hand and Power Tool Safety, 2002, retrieved from www.osha.gov.